New Susan Riedweg jackets have been posted online. 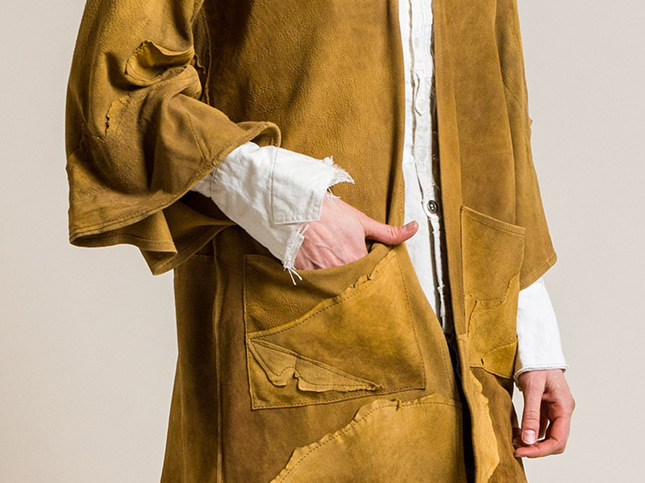 For those new to the eponymous brand, Susan creates unique and handmade garments from collected vintage leather by the artist herself. In the new collection, we received familiar styles, such as her waistcoat and kimono, in new colors. For example, mustard yellow, periwinkle blue, off-white celery, and natural brown are solid dyed onto the leather jackets. Yet as always, each piece uses Susan’s signature patchwork and reverse seam details. The rugged yet stylish aesthetic pairs well with casual brands such as Closed or raw brands such as Greg Lauren. Styled as such, the three brands offer a balance between casual Southwest meets rustic feel. The latest shipment is available both online and in-store at Santa Fe Dry Goods, located on the Plaza in Santa Fe, New Mexico.